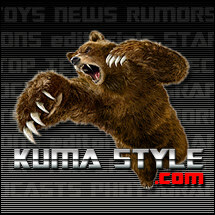 Toy Nippon: BBTS News: Star Wars, Transformers, Marvel, Robotech, Godzilla, Sailor Moon & More! 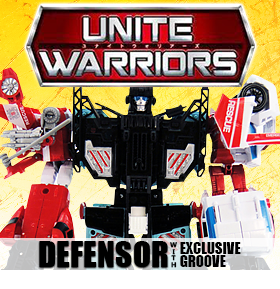 BBTS News: Star Wars, Transformers, Marvel, Robotech, Godzilla, Sailor Moon & More! 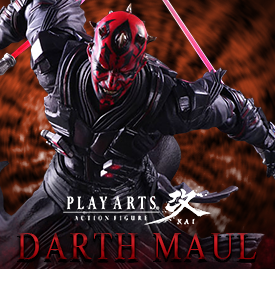 Joining Darth Vader, Boba Fett and the Stormtrooper in the Play Arts Kai Variant line is Darth Maul! This 10 inch tall figure of the double-bladed lightsaber wielding Sith Lord comes with two head sculpts (normal and scowling), four pairs of hands, three lightsabers with blades, and a clear display stand. TriForce proudly presents the officially licensed Mass Effect 3: Disciple Shotgun and Scorpion Pistol Full Scale Replicas. Each replica weapon is cast in polystone, masterfully sculpted and hand-painted by the artisans at TriForce resulting in the most authentic representation available. The Disciple Shotgun measures 23 inches in length and features working LED effects, and the Scorpion Pistol is 14 inches in length and features working LED effects! Own these authentic pieces of videogame history as part of a Limited Edition of 500 pieces each worldwide. Disciple Shotgun is $549.99 and Scorpion Pistol is $399.99. We have two new offerings from Headrobots up for preorder now. The first is the Infinitor Upgrade kit that includes a double barreled gun and a new sword for $27.99 and the second is the Green King Upgrade Kit 2 that includes 2 chrome leg shields and 2 chest armors for $44.99. Everyone’s favorite cheeky childhood toy is coming to Pop! just in-time for Ted 2! We have two versions, Ted with beer bottle and Ted with TV remote for $9.99 each. Check out the Ted 2 Talking Bobble Head for $12.99! While Ted is charmingly foul-mouthed, this Wacky Wobbler is clean enough for your desk at the office! Godzilla: Vinyl Wars is collaboration between Japan's classic sofubi manufacturers and cutting-edge toy maker Medicom Toy. Each release is a reproduction of a classic Toho sofubi from the '60s through today, released legitimately for Western collectors for the first time ever. These hand-crafted, hand-painted figures inspired the designer toy movement, and will hold a place of high honor in your collection! We have added preorders for Meltdown Godzilla, Millennium Godzilla, Hedorah Metallic, Godzilla 1967, and GMK Godzilla with prices ranging between $59.99 and $79.99. Say hello to our little friend! Tony Montana joins the ReAction world as part of the Scarface series. He’s wielding his infamous AK-47 and is ready to enact some vengeance, petty or not! We’ve added 16 new preorders for exclusives from Gundam to Figuarts and you can find them all in this list. Check out the awesome Avengers Age of Ultron Figuarts Shogokin Hulkbuster that stands 10 inches tall with die-cast parts and LED light-up features for $489.99; or the Kamen Rider Birth Prototype for $142.99 and the Kamen Rider Sigurd Cherry Energy Arms for $88.99; and this 2 figure set - Robot Damashii Unicorn Gundam & Banshee Norn Final Shooting for $228.99! Ronald Reagan was the 40th President of the United States of America, serving two terms from 1981-1989. He was most known for bringing a peaceful end to the cold war and having an unabated and passionate love for the United States. He is considered to be the most influential president since Franklin D. Roosevelt, leaving his imprint on American politics, diplomacy, culture, and economics through his effective communication, dedicated patriotism and pragmatic compromising. This 1/6 scale figure of President Reagan is dressed in a suit and comes with a microphone podium. Rule your plate with honor and skill with chopsticks based on the historical samurai swords of feudal Japan. Each set includes a special chopstick case and rest featuring the crest of each samurai’s family! At 9 inches long, these chopsticks are fully safety tested and fun for the whole family. Remember, these chopsticks are designed for eating not fighting! We have Keiji Maeda, Masamune Date, Yukimuru Sanada, Motochika Chosokabe, and Yoshihiro Shimazu sets on preorder for $14.99 each. From The Elder Scrolls V: Skyrim, Gaming Heads presents the magnificent 1:1 scale bust of Dragonborn, the prophesized hero born with the power of the Voice. Utilizing the horned helmet and armor synonymous with his appearance, this hand-painted bust is made completely out of polystone to capture every intricacy of the Dragonborn in outstanding detail. This bust stands at an imposing 25 inches tall and is limited to 600 pieces worldwide, making it the quintessential addition to any Elder Scrolls fan's collection. Are you ready for the next three figures in the popular Revoltech Micro line by Kaiyodo? From Metal gear Solid 5, we have RM012 Venom Snake Olive Drab standing nearly 5 inches tall with 16 points of articulation and a bunch of accessories (including a cool eyepatch); and from Blood Blockade Battlefront, RM013 Klaus V Reinherz and RM014 Zapp Renfro, both standing nearly 5 inches tall with 16 points of articulation and character specific accessories. Beth Tezuka is a born warrior - tough, smart, and has an undying love for butter lettuce. Beth seems to be aware of Chris’s unrequited affections, but is hesitant to acknowledge them, despite her feelings for him. Her future holds a dark secret only Emotion Lords are aware of. Chris Kirkman seeks adventure wherever he can find it! Willing to do whatever he must to help out his buds, he’s a natural leader and very protective of his teammates. Chris only falters when it comes to expressing his true feelings for Beth. Chris is destined for a future he will do everything in his power to alter! These fully articulated 1/6 scale figures feature unique skinned armature bodies, detailed fabric clothing, and removable technological gloves. The Galaxy Commanders figures are based on the classic Hong Kong action figure originally released as Starroid Raiders in 1977. While each piece is a Japanese style sofubi soft vinyl figure, there are 7 points of articulation to replicate the play value of the original action figures. Heads are interchangeable between the figures and other weapons (sold separately) will be be available in the future. We have Commander Cytron, Commander Nizard, Commander Dagan, and Commander Mach up for preorder now. TW-T04 Highway transforms from robot to blue sports car and becomes the left arm of the gestalt for $59.99; TW-T05 Shinebug transforms from robot to gold sports car and becomes the back armor of the gestalt. Shinebug also comes with the gestalt feet and is listed for $84.99. TW-T06 Sideload transforms from robot to orange tactical truck, is the torso of the gestalt, and comes with the gestalt head, shoulder, blaster and hands for $94.99. TW-06 Evila Star is a triple-changer that can transform from robot to space shuttle to train engine and is listed for $114.99. To Carzap, life is like a racetrack, a cyclical loop that presents new opportunities to make up for those you have missed. This club exclusive version is in the Deluxe Class, is styled after his G2 Block Town deco and even comes with a Kre-O set with Kreon figure. "You’ve just received the final clue in the Riddler’s latest larcenous plot… but how to open it without triggering any booby traps the felonious fiend may have secreted inside? Reach for your utility belt and withdraw the Arkham Knight Batarang Letter Opener! Based on the actual 3-D files from the newest Arkham Knight blockbuster, this lightweight metal replica measures 7 inches long! With this piece of the Arkham arsenal on your desk, they’ll be no doubt in your office who owns the night!" Let clients know that like the Dark Knight himself, you are prepared for any situation with this attractive Batman business card case! Made from high quality metal and featuring the embossed bat logo, this lightweight case is sure to strike fear into the street punks of Gotham. Up, up and away! Let potential clients and business contacts know that you're a super human with this stylish Superman business card case! Made from high quality metal and featuring the embossed S-shield logo of the Man of Steel, this lightweight case offers a sleek look that is sure to please any Superman fan! From H.P. Lovecraft's classic horror short story The Call of Cthulhu, comes the evil old god in adorable Pop! form. This glow-in-the-dark version stands 5-inches tall and makes a great gift for any Lovecraft fan. The top-down game was released in 1992 for the super popular 16-bit home console. City Hunter stands 8" tall, with over 25 points of articulation for great poses, plus staff, disc, skull and spine accessories. Special paint deco reproduces the stylized 16-bit look of the character from the end title screen. The figure comes in special window box packaging to re-create the look and feel of the classic video game cartridge box. This upgrade kit is designed to enhance a certain combiner and includes a set of purple hands and feet that can also transform into weapons. These Pop! vinyl figures are based on characters from the historical drama Vikings that is centered around Ragnar Lothbrok, legendary Viking chieftain and self-proclaimed descendent of the Norse god Odin, as he fights his way into becoming Scandinavian royalty! The rest of the line include Ragnar's ruthless brother Rollo, Floki, the incorrigible shipbuilder who doesn't know how to swim, and Ragnar's shield-maiden Lagertha makes for strong company considering how she's battled her way into Viking leadership! Of course, each of their fates can be seen through the shamanistic powers of the Seer! And shepherds we shall be, for Thee, my Lord, for Thee... Murphy and Connor MacManus, the vigilante brothers from the cult classic film Boondock Saints are now in the adorable Pop! vinyl form. 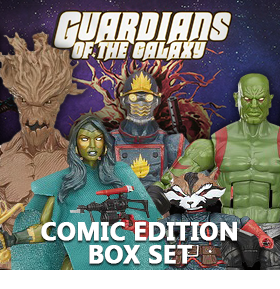 These two will exact their brand of justice on your collection!